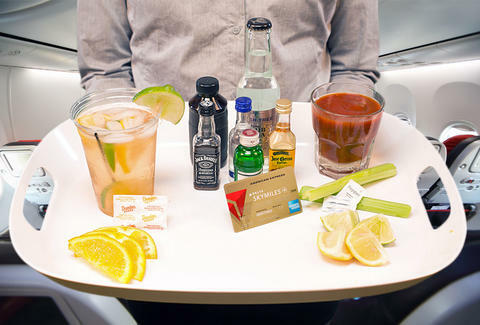 Whether taking a puddle-jumper or a transatlantic red-eye, there's no reason to settle for (ho-hum) airplane G&Ts when -- with a little foresight and some pre/ post-security prep work -- you can mix bar-quality libations in the comfort of seat 18E. Here are three tips to making top-flight cocktails at altitude, along with four easy drinks that require no more than a few basic ingredients. 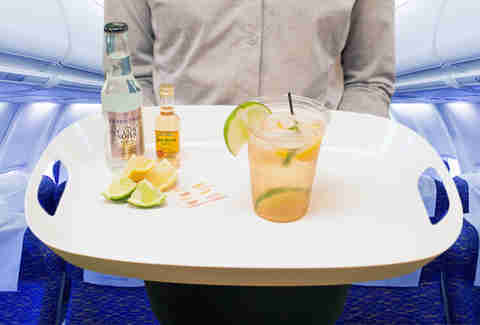 It's a little-known fact that the TSA allows you to bring sealed mini-bottles of booze through security; you're just not technically permitted by the airlines to drink them onboard. So, you'll need to be cool. That said, if you want to take your mid-air mixology up a notch, stop by your local liquor store for a few secondary ingredients, i.e. Kahlua, Jägermeister, Vermouth, etc. Just make sure they're smaller than 3.4oz (100ml) and you put them into your single, one-quart Ziplock bag to run through security. Take two minutes and throw some essentials in there, too: mini bitters, hot sauce, simple syrup -- a 2oz medicine bottle/ dropper works well if you only have normal-sized bottles at home -- and a bag of lemon/ lime slices, olives, pearl onions, orange rind, celery sticks -- whatever your favorite drink calls for. Seriously, it takes five seconds to slice a lime and throw it in your carry-on; it'll make all the difference. Channel your inner-McGuyver (who will later meet your inner-James Bond) and filch packets of sugar and pepper, then buy a can of Red Bull, a pint of chocolate milk, etc. Don't forget to snag a large cup, lid, and straw from the closest fast food joint if you're mixing something traditionally served in a highball. Prep: Nothing beats a classic. 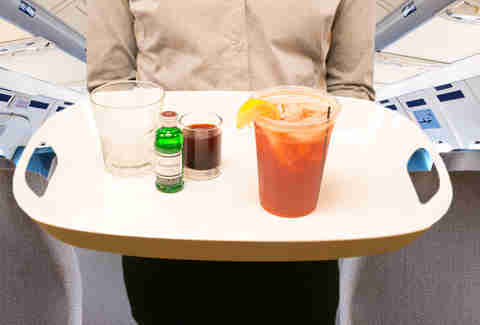 Perfect for your short business flight, simply mix the sugar packet with 3-4 dashes of bitters and a splash of water. 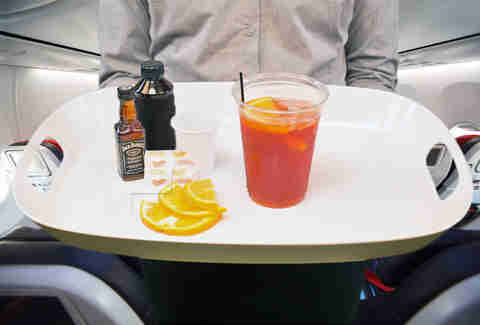 Add whiskey, stir, and -- if you really want to impress and/ or cause the woman in the adjoining seat to sigh in contempt -- garnish with an orange slice. Prep: This party starter is usually served in a highball glass, and is as simple as mixing 2oz of Jäger, 1oz gin, and ice. Top with the Red Bull and stir. Now enjoy the herbaceous flavors of gin and Jäger all the way to an epic weekend in Vegas. Prep: Eschew the canned tomato juice/ Mr. & Mrs. Ts and jazz up your average airplane vodka with 10 dashes of hot sauce and a pinch of pepper. 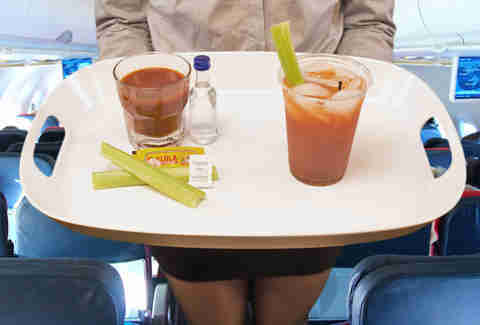 Not only does it taste like a traditional Bloody, it has the legs to help kick that hangover on an early morning flight. Also, like Reggie Miller, it's a great shooter. Prep: Really prove your chops by jury-rigging a Collins drink out of a few basics. Squeeze two lemon quarters into a cup of ice, sprinkle with half a pack of sugar, and mix in the tequila -- bonus points if you use silver for its neutral flavor. Garnish with a lime wedge before toasting your rowmate's pedestrian vodka and OJ.